Listen to all staff. Staff have the final decision. Follow the Forumotion terms of service. While in character, you must post four to eight sentences per post. If you use a picture as a reference, please make sure you aren't stealing it. Do not claim it as your own, unless it is your own. Even if this is fan-made, this is still supposed to be realistic. Make sure it stays that way. Keep everything PG-13. If you're going to do something you wouldn't find in a PG-13 movie, fade to black. Don't make things overly gorey. Yes, you may kill or inflict bloody wounds onto another cat, but still. Use your common sense. You may not swear in character. 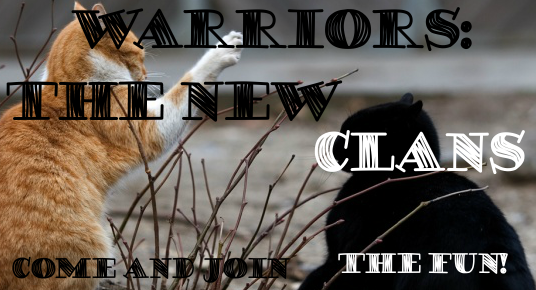 You may only use the words the clan cats would use. Out of character, please keep swearing to a minimum. Thank you. No one word posts. Period. If you're applying for a medicine cat position, you must have a good grasp on the names of herbs and what they do. Respect other members. Do not discriminate, flame, or troll other users due to race, religion, gender, sexual orientation, and any disorders/disabilities they may have. Rule number four has been updated! Instead of being a maximum of two characters to start, there is a maximum of four characters to start! The rule stating a maximum number of characters has been taken down!